Originally from South America, chillies are members of the capsicum family and are now grown throughout the tropical regions of the world. There are many different varieties of chilli; Mexico alone has 100 kinds, and they vary greatly in colour, heat and pungency. 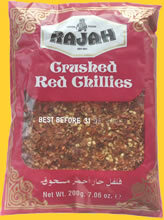 Rajah crushed red chillies are selected for their consistent heat and colour.